Chef Kenny's Range - Chillin' out in WA - Have an Ultralicious day! Our Chef Kenny's Extreme Heat Range. These Gluten Free West Australian made sauces are to be used with Caution! Chef Kenny's Aussie Smokin' Hot Sauce is hand crafted with the Bhut Jolakia or Ghost Chilli - One of the hottest chilli's known on the planet. Adds a smoky heat. 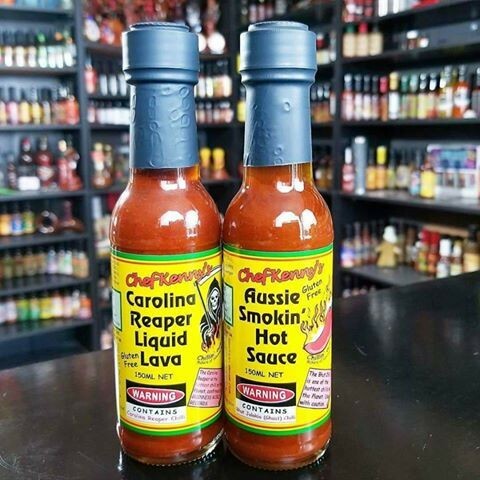 Chef Kenny's Carolina Reaper Liquid Lava is hand crafted with Hottest Chilli on the planet as confirmed by Guinness World Records. Handle with care if you dare!